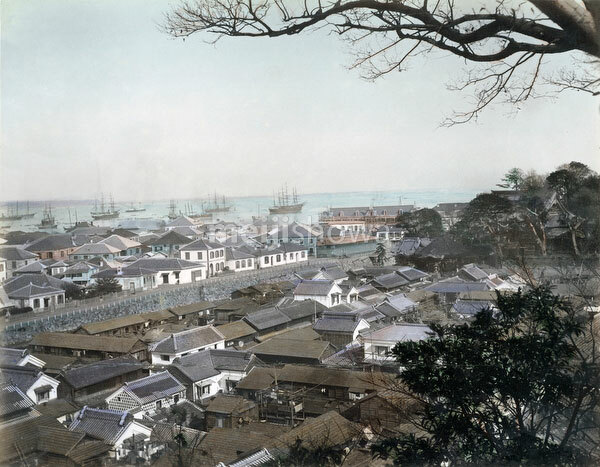 View on Motomachi, Yokohama Foreign Settlement (山下居留地) and Yokohama Harbor from Motomachi Hyakudan (元町百段) at Sengenzaka (千問阪) in Yokohama, Kanagawa Prefecture some time in the 1880s. In the foreground is Motomachi where the original villagers of Yokohama were resettled. Zotokuin Temple (増徳院) is visible on the right. On the other side of the Horikawa Canal (堀川) is the Yamashita Settlement. The oblong building on the coast is the Grand Hotel, which was built in 1887 (Meji 20).